The picture below shows Boomer's Reversed or Putting Grip. The reversed overlapping grip gives more right-hand feel. 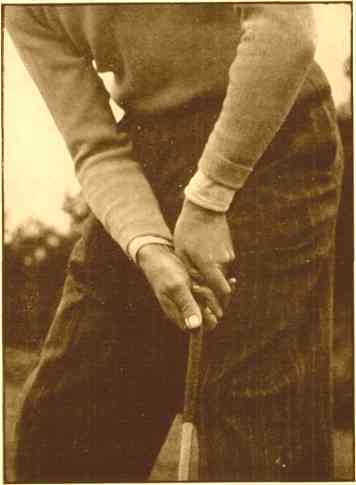 In fact, the palm of the right hand facing the hole gives the impression that the ball will be "rolled out of the hand towards the hole." The club is held not in the tips of the fingers of the right hand, but down at the roots of the fingers. The right thumb is on the top of the shaft. The right elbow and forearm rest lightly in the curve made by hip and thigh. The back of the left hand rests lightly on the left thigh. The left elbow is almost facing the hole ... as is the back of the left hand. Both knees are slightly bent, the weight is well back on the heels  as if sitting on a shooting stick. The weight is more on the left foot than on the right. The ball is just inside the left heel.